Printed for free distribution as a gift of the Dharnma By the Sir Lalita Rajapakse Charitable trust. Else Buchcholz was born in Hamburg in Germany on 11 th of February 1886. During an epidemic of cholera, soon afterwards, both her parents died on the sarne day ! She was adopted by wealthy foster parents, and taken to Berlin. Music, singing, dancing and horseback riding were an important part of her upbringing. She grew up to be a pretty young girl, leading a carefree life, with all the comforts of German high society. She had lovely blue eyes and winsome ways. Amongst the musical instruments she learnt, she was very proficient in the violin. She also possessed a trained musical voice. Life seemed wonderful and full of sweet promise, when unfortunately in 1912, her foster parents also died. Upon their death she inherited a considerable fortune from them. Else then went to live in Odenwald, in the South of Germany. There were many poor and needy people in this village, and she had great joy in helping them financially owing to her innate quality of generosity. But she was sorely troubled by her fate, of not only loosing her parents, but her loving foster parents too. This brought her immense sadness; also some unanswerable questions to her young mind. How could, and why should, the All Merciful God, whom she believed and trusted in, have chosen to inflict this awful burden of sorrow on her? Try as she might Else found no acceptable solution to her questions. One day, while reading some literature in the waiting room of her Dentist, she came across the quotation, "None can help another out of the Mire, unless he himself stands on firm ground." She was greatly impressed by the truth of this statement, and immersed herself in the reading of books on philosophy. Fortunately for her, the Tri Pitaka (the Buddhist Canon) had already been translated into German and eventually, Else Buchcholz came across this very same quotation, in one of the Discourses of the Buddha. From then onwards, while still in her youth, she became utterly and deeply interested in the philosophy of Buddhism. In this way, quite unknowingly, she stepped on to the Noble Path leading to the Cessation of Sorrow (Nirvaana), that the Great Teacher, Lord Buddha taught the world, in the 5th Century B.C.! The First World War was still in progress. Amidst the chaos and all consuming anger around her, she taught herself Meditation. Satipattaana Bhaavanaa (dealing with the defilements of both body and mind) was the method she sought for her emancipation. In 1919, it was Else's good fortune that she came to know two learned and pious German Buddhist monks, the Venerable Gnaanaathiloka and the Venerable Vappa. During the War, they had been repatriated to Germany from Sri Lanka. There was a shortage of food and amminities in Germany, and Else offered them hospitality at her home in Odenwald. Nnen times became really hard, she had given violin lessons, and with her earnings sustained these two holy monks! She also made arrangements for Ven. Gnaanaathiloka to stay in Berlin, in order that he may complete the translation of the Paali Buddhist text "Milinda Parina', into German. Because of her association with these two monks, she gained considerable knowledge of the Buddha Dhamma and its historical background. She was determined to go to Sri Lanka, which she heard was the only country where Theravada Buddhism ( the Teachings in their pristine form) was well preserved. The Study of the Sraavaka Saŋgha (the Worthy Ones) had kindled in her a great desire to be a Nun herself She decided to give up her wealth, her homeland, her friends and her religion, and to set sail to Sri Lanka, then famous as "Dhamma dvlpd', the Island of the Doctrine. In 1920, at her sole expense Else with a few friends and the two Venerable Monks, embarked on a ship to Sri Lanka. This period was the aftermath of the First World War. They being Germans, were not allowed to disembark in Sri Lanka, then a Colony of the British. As such they had to proceed to Japan, where Else spent 5 years, studying Mahaayaana Buddhism. In 1926, she once again set sail to Sri Lanka and to her great relief, was allowed to land on the Island of her Goall. Her first friend here was Marie Musacus Higgins a German Educationalist, who was the Founder of a school for Buddhist girls Musacus College, Colombo. She was a true friend to Else, and gave her all the help, protection and encouragement to ordain herself as a Nun. On 20' May 1926, Frauleine Else Buchcholz renounced the world, in the serene and holy environment of the Sri Mahaa Bodhi ( the tree that grew from a sapling of the Bo Tree under which the Buddha attained Enlightenment), at Anuradhapura. With shaven head and in saffron robes, she observed the Ten Precepts of a Dasa Sil Maathaa (Buddhist Nun). Perhaps her beautiful blue eyes inspired her Teacher Priest to name her Uppalavannaa Blue Lotus. At first she lived in a small thatched hut, very close to Vajiraaraarria, Colombo, a temple welt known for the erudite and pious monks who resided there. From the chief incumbent Venerable Pelene Vajiragnaaria, she gained more knowledge in Satipattaana Meditation. She stayed in Weligama for a while . Thereafter, she moved to the cooler hills, to a simple hermitage in Wariyapola, Panwilatenne, above the town of Gampola. By this time she had a coterie of admiring and devoted benefactors, prominent amongst them being Mrs. H.M. Gunasekera, Mrs. Nalin Munasinghe, Lady A.M. de Silva, Mr. William Samarasinghe, Mr. H.W Amarasuriya and Sir Lalitha Rajapakse, sadly all deceased now. They saw to her needs, albeit small, because Sister Uppalavanna did not wish for anything. She would always belittle her requirements, saying that the less she has, the happier she feels and, more able to persue her goal of getting on to the Path to Emancipation. She insisted on Pindapatha, (going on aims rounds), the time honoured way an Ordained Person sustained life. If her noon meal was late even by a minute, she would smilingly forego it, another time honoured practice of a Disciple of the Buddha ! She spent almost all the time in perfecting her meditation practice. She very rarely used the bus as a mode of transport, although it was free of charge for ordained persons, preferring to walk miles between her Hermitage and the towns such as Kandy, Colombo and Anuradhapura ! It took the Sister days for some of these journeys. Many of the roads and footpaths fell through jungles, infested with wild beasts and venomous serpents. But she enjoyed these treks, for many reasons. Firstly because she believed in the simplest things in life. Secondly, she could break journey at the houses of her benefactors. Above all, she welcomed the opportunity of overcoming dangerous animals, with the power of her thoughts of Loving Kindness towards them ! She used to say that she traveled light, taking only a change of robes, a yellow umbrella, her alms bowl and a handkerchief to strain drinking water; but she carried a wealth of good will and loving kindness to all living beings, practising the Anapanasati (total awareness) Meditation during most of the journey. Many were the tales she related about her encounters with wild animals. Once, on a jungle footpath, she had come face to face with a leopard ! Sister and the beast have locked eyes, and she had gently recited the stanzas of Loving ~ Kindness (Mettaa Sutta), while emanating thoughts of loving kindness towards the animal. In a minute or two, the leopard had brushed past her quietly! Another occasion, in a deep forest, she had come upon a wild elephant. In her musical voice she had again recited the stanzas of Loving Kindness, while emanating waves of thoughts of Loving Kindness towards the fearful beast. The elephant had merely touched her face lightly with its trunk and turned away from Sister Upplavanna, and continued on its way! Such was the strength of her Harmlessness (Ahimsa,) a greatly prized attribute amongst all Buddhists. Small won'der then that she could live in remote places, in jungle fastnesses, for well nigh 45 years, without ANY mishaps. All sentient beings, visible and invisible, do not harm those, who wish no harm to them. In fact a person engaged constantly in wishing the well being of others, is protected from danger and harm, by everyone else. Wherever she resided, she attracted stray animals. It was not that she wished to have pets. She avoided all forms of attachment. But, every community of people, has a small percentage of callous and hypocritical persons, who dump "difficult situations" on others. So, certain villagers would surreptitiously bring poor kittens and puppies and leave them in Sister's hermitage, or cave dwelling. She would speak to them kindly, sharing her frugal meals, and giving individual names to them such as Podirala, Menike, Appuliamy etc! She cared for their welfare to such an extent, that she would not go overnight to a town, even for her medical needs, worrying about what they would do for food. There have been occasions when her Benefactors had to bring a doctor to her door, and while Sister was being examined, bundle a puppy or two into a bag, to take away to re home them, some where else!. Sister Uppalavanna always chose to live far from the towns and villages, in simple abodes, be they rude huts, or converted caves, without any amenities, such as electricity or water on tap. She who had lived in the lap of luxury in Germany, did not even crave for the ordinary comforts available in some of the towns of Sri Lanka. Her view was that the closer one lived to nature, the easier it was to get on the "Path", When asked by friends as to why she did not write or discourse on the Dhamma, she replied that she was intent on treading the Path to Emancipation, as quickly as she could, and that she wanted to spend as much time on meditation so 1 as to get rid of the defilements in the mind. She further expained that Writings and Discourses could lead to self aggrandizement, which is a step backwards, and not forwards! Nearly all who came in contact with her, believed her to be a Worthy One (Sraavaka Saŋgha). They also believed that perhaps she had reached the 2nd Level to Sainthood Sakkaadaagaami. An incident related to her friends, by a couple of Tourists, illustrates Sister Uppalavanna's attitude to all mundane things, the most dangerous being money, When these two persons had visited her at her abode, impressed by her qualities and knowledge, and feeling sorry for her poverty, they had tried to persuade her to accept a note of currency of considerable value. She had used a twig so as not to even touch the money to sweep it out of her hud. She adhered to the Rules (Vinaya) to the letter. When she was nearly 80 years old, held up as an example of piety and strength of purpose, she was introduced to a very young Monk, by one of her Benefactors. To the amazement of the people who were there, Sister Uppalavannaa, fell on her knees and paid obeisance to him, with her forehead on the ground, because he was her Senior in the Dispensation (Saasana)! The Warakaulla Family of Kandy was Sister's devoted benefactors for many years. Another resident of Kandy, Mr. Gilbert a kind and generous businessman converted a rock cave into a habitable place. This was her final hermitage called Manapadassana lena(Cave of Pleasant View). Rumour had it that Saints of yore had dwelt there. Sister was pleased with that idea, and negotiated the 98 steps up the hill to this cave with great ease and delight. Whenever anxious questions about her state of health were put to her, she would cheerfully reply that the Doctor always said, her heart was as strong as that of a young girl's! She went down the hill to draw water from a well, but when it rained, she cleverly collected the water that sluiced off the roof into a bucket, for her ablutions!. It was to this cave that a German Ambassador by the name of Dr. Hildegunde Feilner and her Secretaries Ursula Mueller and Irmgard Predel went with tidings from Germany that Frauline Else Buchcholz, presently a Buddhist Nun named Sister Uppalavanna, in Sri Lanka, was left with a fabulous fortune in her native land, which included 3 mansions and a string of shops; and that she could make claims to get possession of it. Sister's reply was typical. "Please do not trouble me with such information. I have no desire for anything worldly, 1 am striving for emancipation from greed, hatred and delusion!" Such was the strength of her convictions and vigour of ascetic discipline. Around 1980, when her health was deteriorating, and physical debility was catching up on her, some of her devoted Benefactors such as Lady Raajapakse, Mrs. Leelaa Gunasekera Mrs. D.D. 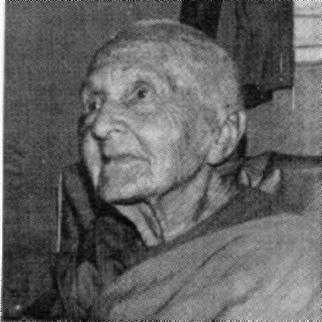 Jayawickreme, Mrs. Ayomaa Wickremasinghe and Mrs. Pearl Alles, persuaded Sister to come down to Colombo and enter the Mallikaa Nivaasa Home for Elders, so that she could be well looked after. Aware of her piety, principles, and adherence to the practice of the Dhamma in the truest sense, the Committee of this home, led by Mrs. C.H. Gunasekera took her in gladly and with great reverence. Else Buchcholz was unfortunate enough to be orphaned as a child; to lose her foster parents as well, in her youth. But obviously she possessed at least on blessing, as enumerated in the Great Discourse on the Auspices (Mahaa Mangala Sutta), that is "having performed meritorious acts in past birth". Because of this, she was fortunate enough to step on to the Path. Not only that, to be surrounded thereafter by Benefactors, who were as loving and caring towards her, as her surrogate family. There were people in Sri Lanka who stood in as her parents, her brothers and sisters, her children and even her grandchildren. Therefore, she was well looked after even during her short stay at the Mallikaa Nivaasa. Her devoted friends formed a Group that supplied her every need. They counted themselves very fortunate to have the opportunity to be of service to such a unique and pious personality. Sister Uppalavannaa passed away peacefully with a beautiful glow lighting up her face, in 1982, at the age of 96. It is certain that she attained another propitious human birth, where she would have every opportunity to tread the Upward Path steadily and surely to the attainment of Sainthood and Nirvaana. Sraavaka Saŋgha. When we think of the Saŋgha or recite that familiar verse enumerating the virtues of the Saŋgha, we must remember that we mean the Sraavaka Saŋgha the Disciples of the Buddha. At the lowest level the Saŋgha mean you and me, the Upaasaka, Upaasikaa. On the next level are the Bhlkkhu Saŋgha, the Ascetics. At the highest level are the Sraavaka Saŋgha, who are the Follower of the Path, Stream Entrants and Stream Winners. The Sraavaka Saŋgha are the "Atta Purisa Puggalaa', the eight types of persons who are in the process of attaining, and have already attained the various levels of Mental Discipline, leading to Sainthood; that is Sovan, Sakadaagami, Anaagaami and Arahat. It is these Worthy Ones that we venerate. The present day Bhikkhus represent the high spiritual achievements of the Sraavaka Sangaha, inspiring us to a least, strive towards the Sovan state of mind. We remember their fine qualities of being learned in the Teachings, being on the Straight Path, being on the Methodical Path and being Disciplined in every way. The Sraavaka Saŋgha fall into four pairs of persons, "Cattari purisa yugani". those striving towards, and those who have attained the four mental states leading to Sainthood, as mentioned earlier Sovan, Sakadaagaami, Anagami and Arhat. Truly a very determined and energetic lot of persons! Therefore all these people who strive so diligently to eradicate the three Cankers Greed, Hatred, and Delusion by treading the Noble Eightfold Path, are worthy of our Sacrifice, our Hospitality, our Offerings and our Salutation. Indeed they are the most fertile fields of merit, "Punnakkhettan', where whatever we do for their spiritual uplift, comes back to us a thousand fold!